My aim is simple; to assist a singer in achieving THEIR perfect sound whilst maintaining the best possible vocal function. More experienced singers often have strong direction in their stylistic identity but occasionally experience limitations in their range, flexibility or power, or may even be suffering from tiredness and vocal health problems. In just a short time I can help you to develop areas of your voice that may not have been usable, or release any tension or discomfort that has crept in over time using tools that encourage smooth coordination of the vocal folds throughout the range. On the other hand, things might be feeling wonderful but you’re keen to tick off a few more entries from the vocal ‘wish list’. Either way, if you improve the function of your instrument you can turbo-charge it with adjustments to other parts of the singing process such as breathing and ‘vowel tuning’ to access a cracking belt voice, a ﬂoating mix, or maybe a classical head voice. The best bit is, you’ll be skilled enough to do all 3… if you want to of course. The vocal tools I have built come from many years of research, input from world leading voice scientists, and constant (and I mean constant) experimenting with my own voice and willing subjects. I even measured my students with a spectrogram ’n’ everything. That’s when it got really geeky. I was ﬁrst authorised to teach a technique called Speech Level Singing (SLS) in 2008, which gave me by initial coaching experience. After a few years I took on the tools that I thought were valuable (which wasn’t everything I might add) and went in search of answers to the questions that remained. 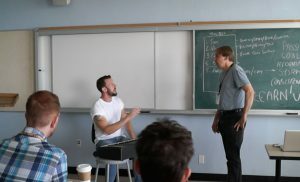 After that I spent a lot of time with voice experts and scientists, like Dr. Ingo Titze, to get the most current scientiﬁc theories on singing, including belting and screaming. Those theories, and a few weird equations, took a lot of distilling into usable and relevant vocal activities that greatly improve the art of stylistic singing. Combine all that training and education with working with teachers of all disciplines including Estill, Breathing Coordination, Accent Method and CVT, and here I am. I am now an authorised instructor and teacher trainer for the Vocology In Practice worldwide network, a voting member of the Pan American Vocology Association (PAVA), and a coach for singers all over the world. My specialism for taking scientific research and testing and developing it for practical use takes me frequently over to Los Angeles to educate the international teacher fraternity on what actually works. How can that beneﬁt you? Well, there’s a lot of misunderstood teaching methods out there that are either useless, temporarily helpful, or great but applied incorrectly. 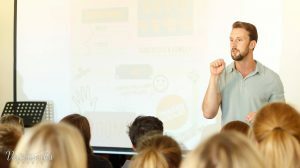 Combining the science, a bag of experience, and a strong network of professional colleagues has allowed me to guide my clients with genuinely effective training methods that don’t waste time training in the wrong habits. Only the good ones that sell records, keep you touring and score you auditions. And, more importantly, not put anyones voice at risk of injury unnecessarily. In addition to developing technique, vocal sessions often gravitate towards working with style, song delivery and stage presentation, improvisation techniques and even extreme singing styles. The ability to play with vowels and emotive sounds and will open up the world of tone and style. Style and interpretation is a cornerstone for anyone who is looking to publicly perform as it creates a magic connection with your audience and adds feel and sincerity to a song. Add improvisation to that and then you get even more scope to ﬁnd your groove and create your own unique style. I’ll bang on about it one more time… but a solid technique, control and vocal flexibility is the best platform to explore your voice stylistically. It removes the barriers to expression! Helping a singer to strike the perfect balance between technique and artistry is a tricky job, but it’s one I’m here to help with!